How is new polyolefin capacity going to affect your business strategy? What impact will the circular economy have on polyolefin supply and demand? Where are the key opportunities to capitalise on within the end markets? With new capacities coming online across the globe and shifts in supply and demand dynamics, it’s vital that polyolefin producers, plastics convertors, traders, distributors and the rest of the value chain keep informed of the latest developments in Europe, the USA, Asia and the Middle East. 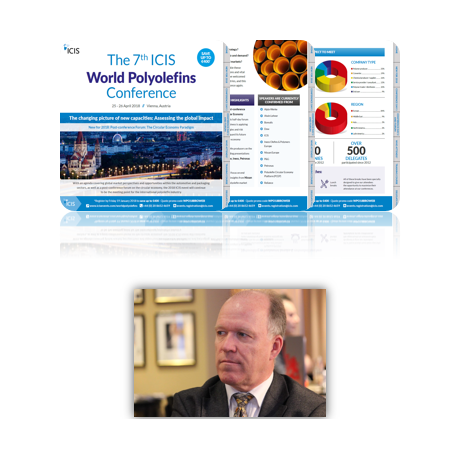 With an agenda covering these market perspectives as well as opportunities within the automotive and packaging sectors and a post-conference forum focused on recycling and the circular economy, the 2018 ICIS event will continue to be the meeting point for the international polyolefin industry. Hear from Hugo-Maria Schally, Head of Unit, DG ENV B.1 Sustainable Production, Products and Consumption, European Commission, via video conference, as he discusses how to prepare for the European Commission’s Strategy on plastics. Hugo-Maria’s presentation will review the current status of the Strategy as well as how it will affect the polyolefin business moving forward. He will be presenting as part of the Circular Economy Forum, for which you can find more information here. This half day forum will enable attendees to better understand the impact of the circular economy on their polyolefin businesses, the preparation they need to put in place and the risks they need to mitigate. Just a day before the conference, ICIS is delighted to announce the first European Polyolefins training course in Vienna: An Introduction to European Polyolefins: Industry fundamentals and market dynamics. Take advantage of the opportunity to gain essential information on the industry. This one-day training aims to add more value to your product knowledge, define polyolefin cost drivers and the various factors influencing market competitiveness.